1. Cheese & Crackers Serving Board :: I don't actually eat cheese and crackers but I know other people do and this was too neat not to share. You could totally fill this with cookies too. 2. Salts of the World Test Tube Set :: This would be such a neat gift! Not only would it be fun to try different salts, the packaging is amazing. 3. Mushroom Kit :: I have actually been thinking about getting one of these kits for a while now. It looks cool and, after about 10 years of trying, I finally like mushrooms. Yes, I really did work very hard to like mushrooms. 4. State Dish Towels :: Obviously I don't live in a State (Canadian over here) but I think these are so neat! I love the embroidery and it would be cool to collect one for each state I have visited. 5. Baby Fortune Cookie Booties :: Uh, cutest booties ever. Not technically for me but I wouldn't mind going back in time and having these when Milo was tiny. 6. Flavour Infuser Water Bottle :: This looks so pretty and delicious. 7. 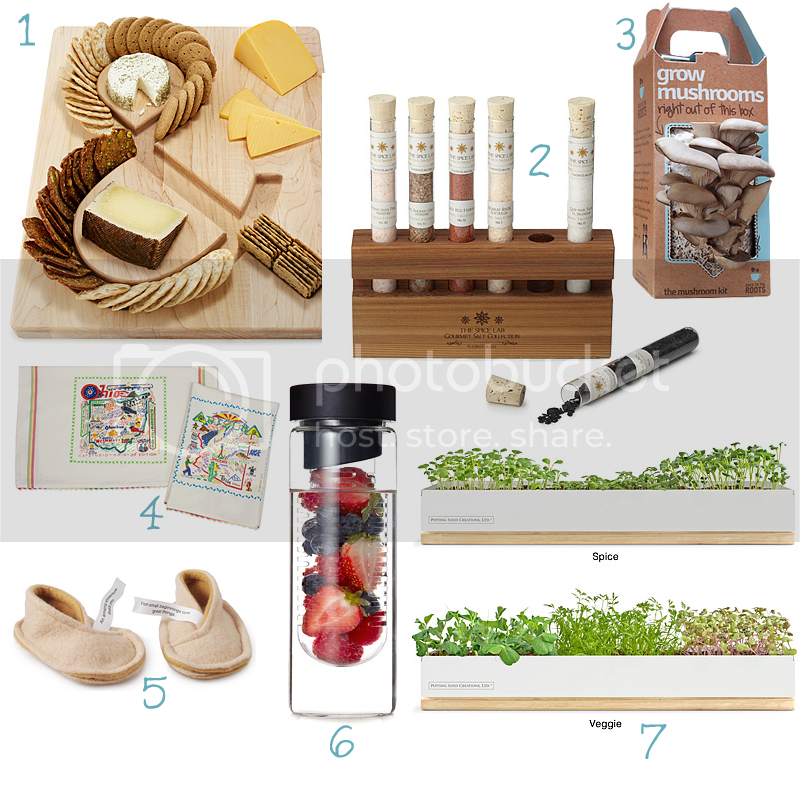 Micro-Greens Kit :: Yes please. This would be a lovely addition to our kitchen. In case you aren't familiar with Uncommon Goods, they are a really great company that features unique designs and handcrafted gifts while staying committed to treating people, animals & the environment with respect. There are so many amazing products on their website and I think it is pretty great that about one third of them incorporate recycled/upcycled materials and most are made in the USA. I mean, the US is no Canada but I guess it's still pretty cool. In addition to the Mothers Day gift guide, you can click here to see some suggested gifts for women. If you want something personalized you can also search for that here. I hope you are all having a good Tuesday. We have a car appointment today and then I will be headed over to Service Ontario to get a new licence sticker. I know, I know, my life is very exciting. Try not to be too jealous of all the glamour. This post was sponsored by Uncommon Goods but as you may have noticed, I have never actually done a sponsored post before because I am really funny & picky about them. I really do love a ton of the items that Uncommon Goods carries and I think you will too. Also, they seem like a genuinely good company that I am proud to work with. Those baby booties are too much much! So cute! That ampersand board is AMAZING!! Why do I never know about anything cool happening in Hamilton? Oh right, because I'm not cool. That would have been neat. We turned over our garden on Saturday so at least I didn't miss out and do nothing!